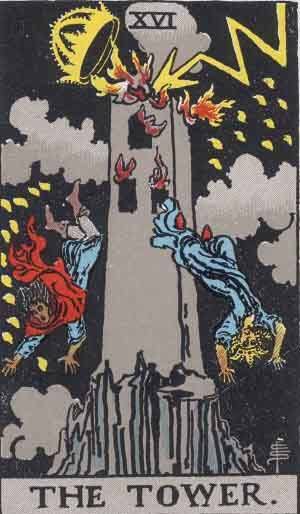 The Tower is the 16th Major Arcana card. Widely regarded as one of the most negative cards to draw; if it is illustrated with a chaotic scene; fire, lightning and people falling from a building. A truly horrifying spectacle. The Tower represents sudden, almost frightening change, disruption and conflict. Past – The Tower in the Past position means that you may have had a traumatic event happen in your past. It could be distant or recent, but it is still affecting you. Sometimes we experience things that we can’t live with and our senses are overloaded trying to comprehend it. A sudden dead, a cheating spouse or even something as big as a natural disaster. You have to remember that it happened in the past and you are still around, living with it in your head. You’ve grown since, try to understand how much you’ve changed. Present – The Tower in the present position means that a conflict is just around the corner, or is currently ongoing. Try to deal with it as best you can. Arguments might happen a bit easier, and there might be something on your mind. Future – The Tower in the future position represents coming challenges that are going to be extremely disrupting to your regular life. Just as it was happening now, when it comes, try to deal with it in the present. Worrying never helps. Can you see the signs of something falling apart already? It may well be that the inevitable is going to happen, but having some foreknowledge will help you a lot. Work / Education – The Tower in regards to work or education means things are going to get shaky and difficult. If you’re working with somebody in a group project, try not to let them get under your skin. If you’re in a contract or otherwise temporary job, it’ll be worth looking for a backup plan in case your current one doesn’t go according to plan. If you’re in school or college, you might have some recent experience with a big test. Maybe you’re waiting for results. It isn’t the end of the world if you get a bad mark. Romance – The Tower in romance is not a good sign. Make sure you know how your partner feels. The Tower usually means something unexpected and disastrous will happen, so be aware. You might not want to think about it, but is there a chance your partner has been cheating on you, lying, or intends to leave? If you have proof and are uncomfortable with it, try to discuss it. Remember that you want the truth, not to live with a lie. Friends – The Tower in regards to friendship, again, is not a good sign. Pay attention to your friends. Do you still want to be in your current group of friends? Does one of them know a dangerous secret about you? It might come out soon. Money – The Tower in regards to finances means it isn’t the right time to splash your money about. Be conservative and save. Be sure that you’re not buying that big thing on impulse. Do you really need it? Health – The Tower in Health means you should really pay attention to the signs your body is telling you. You yourself know if you aren’t treating it right, and you know how to get healthier through diet and exercise. Laziness is the biggest disease and you can combat it with willpower. It can also mean that something unexpected might happen, so if you’re naturally clumsy, watch out and try not to hurt yourself or break a bone. Mentally, don’t try to cover how you’r feeling with alcohol or drugs, they only mask the feelings. Spirituality and Mentality – The Tower in Spirituality may mean that you’ll come to a breakthrough. This can be positive or negative. Some new fact may bring an existing belief system crashing to the ground. It might also mean that a belief system you don’t subscribe to might become more appealing, as you find out an aspect of it is true. In reverse, The Tower can lose some of it’s negative meanings, but you aren’t completely safe from the bad influence the care resonates with. There is still danger, but it could be delayed. Are you expecting some bad news, but it just hasn’t happened yet? Don’t give up your worry, because it will happen soon. You can take a sigh of relief, you may have some breathing room and time to prepare. There will always be bad things in life, you cannot always avoid them, but at least now you have some time to prepare. We’ve selected live tarot readers to give you a FREE 3 Minute interpretation of The Tower! Scroll through them below and pick your favorite one.